Introducing "The Wing of Hearts"
This is my first Hummingbird painting, What a joy and challenge it was. The Orchid stem I chose for the composition had white flowers on it. I had to change the color to provide interest for the Hummingbirds and took photos of a group of red-orange Orchids. I then changed the color palette of the white flowers. Getting the wings of any bird to appear to be in motion is a great artistic challenge. I hope to include these amazing creatures in other future works. The original has been sold but there will be prints available. 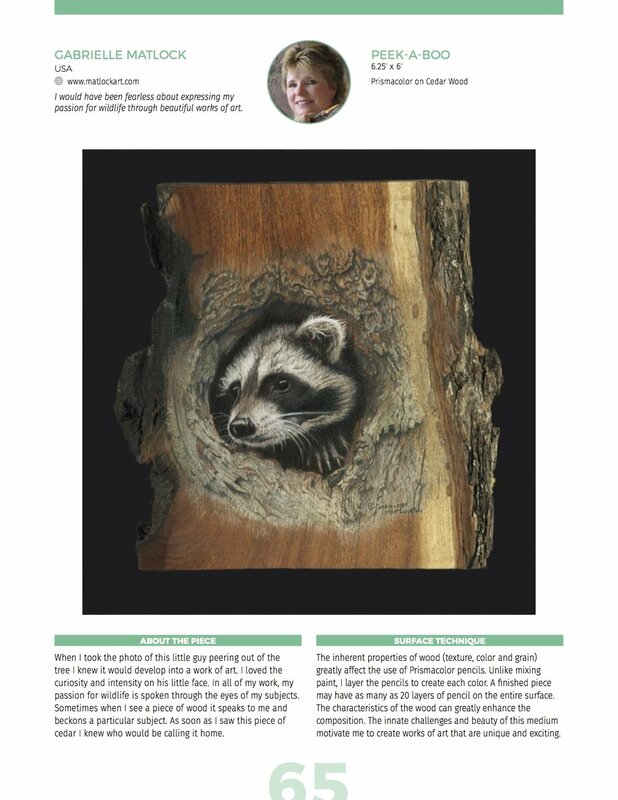 My colored pencil on Cedar drawing "Peek-A-Boo" is being included in the upcoming book CP Treasures V. It's a compilation of selected works of pencil artists from all over the globe. Below is what my page will look like. I'm proud that my work will be noted alongside many great pencil artist from all over the world. In the midst of overwhelming grief, passion can ignite a ray of hope during seemingly inhumane times. Three months ago I lost three good friends in a horrific plane crash in Australia. That same week another young friend died of an aneurism. Four wonderful men lost in a blink of an eye. All very successful businessmen, wonderful husbands, fathers, grandfathers and pillars in our community. We endured five funerals in one week; the grief was overwhelming and almost palpable. My studio has always been a sanctuary of sorts for me. It’s when I’m faced with the most difficult of artistic challenges that I feel the closest to the One who bestowed all of my gifts and talents. Shortly after I learned of the plane crash my grieving soul yearned to do one thing .… paint. I started “Kudos” and with each moment at the easel the intense grief I was experiencing slowly began to change form. Through my creator I began experiencing the souls of my friends in a deeper and truly magical way. I felt their presence around me… it was comforting and almost joy filled. As I continued working, my painting transformed, as did my understanding of life and death. As tears ran down my cheeks I realized that my friends… despite the immensely tragic nature of their deaths… are not gone. They have merely changed form …. their souls are ever present. I think of them often, and when I do, I feel the presence of angels around me. Greg, Russ, John and James… thank you for the indelible heart print you left on all those who loved you. I just finished a drawing on Mesquite piece entitled "Wapiti Pride". I rarely use someone else's photo in my work but in this case a friend of mine gave me a picture of one of his Elk. I loved the attitude and pose of this guy so I decided to use it in my latest creation.